ALBANY -- Tyler Anderson and his teammates found themselves with the same rare opportunity only a year ago. Yet this time around he and the Bellmore JFK boys volleyball team didn’t conclude the season in heartbreak. Instead, they were immersed in jubilation. Bellmore JFK (19-1) ended the 2017 season with a crushing blow in a five-set loss in the state final. Saturday the Cougars jumped out to a quick 2-0 advantage before dropping the third set. 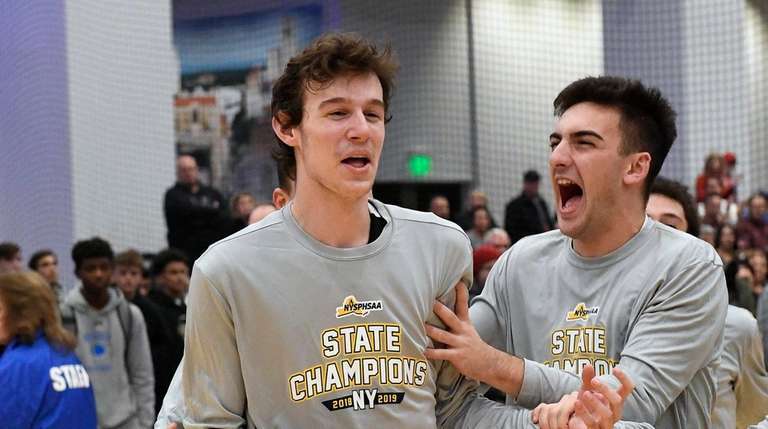 After the Spartans pulled to within 19-18 in the fourth, Bellmore JFK furiously responded with six of the final eight points to capture the state crown. Bellmore JFK defeated Eden, 25-20, 25-23 in their first match of pool play and won the second of two sets against Burnt Hills, 26-24, to advance to the finals. “This season has not been a smooth ride,” smiled Bellmore JFK coach Dennis Ringel. “It’s been a little bit of a bumpy road and roller coaster. It wasn’t all smooth. But we found a way. Guys stepped up in crucial times and made plays. Ringel said the Cougars’ goal entering the season was to play on Nov. 17 in Albany. Nevertheless, there was still a surreal sense after earning that previously elusive final point. Jarzabek spoke about the underlying factors that he believes propelled the squad to championship level.